PERS have existed for approximately 4 decades and have provided users with a streamlined ability to contact Help in the event of an emergency. Many systems connect to Central Monitoring centers that provide 24 hour/7 days a week services to respond when a Call for Help is received. These systems typically feature a single button that initiates the call to the monitoring service. More advanced features such as GPS location, fall detection, and geo-fencing are currently becoming more popular. Does FallCall™ Lite contact 9-1-1? Not directly. FallCall Lite does not contact 9-1-1 directly and is not a replacement for 9-1-1. FallCall Lite uses a subscription Central Monitoring service staffed by Emergency Medical Dispatchers who are able to assess the situation and contact 9-1-1 if necessary. Additionally, the Central Monitoring system will send out real-time event notifications to all paired Caregivers during the event and will contact Caregivers via telephone as directed. Does FallCall­™ Lite automatically detect falls? Not at this time. We are currently developing the technology and anticipate that it will be released in the future along with machine learning capabilities. What do I need to get started with FallCall™ Lite? Both Caregivers and their Elder need to download the FallCall Lite application (app) from the Apple App Store®. It will run on iPhones® running IOS® 10+ and on Apple Watch® running Watch OS® 4+. FallCall™ Lite is currently not available on other mobile operating systems at this time. 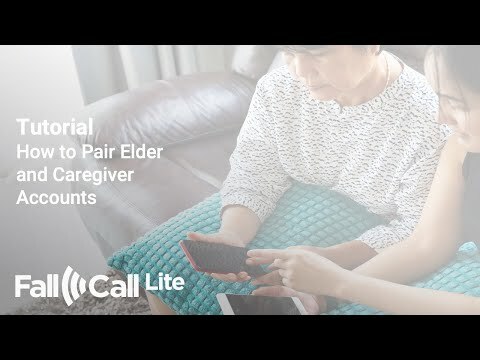 Does both the Elder and the Caregiver have to download the FallCall™ Lite app? Yes. We wanted to create the most simplified experience possible between Caregivers and their designated Elders. FallCall™ Lite will only communicate from one FallCall™ Lite to another. Can I use FallCall™ Lite strictly as an iPhone® app? Yes. Check-ins will include location data only. Heart rate data will only be transmitted if the Elder is wearing an appropriately configured Apple Watch®. Will FallCall™ Lite automatically load onto my Apple Watch? Yes-As long as the Apple Watch® has been appropriately paired with an Apple iPhone® device. The location of the FallCall™ Lite icon can be adjusted through the Apple Watch® menu. On which device do I setup FallCall™ Lite: Apple Watch® or iPhone? iPhone®. It can’t be configured on the Apple Watch®. Who initiates pairing: Caregivers or Elders? Both. Pairing can be initiated by Elders OR Caregivers. See tutorial for more information. Please click the above image to play the video. Can Elders pair with multiple Caregivers? Yes. FallCall™ Lite allows a single Elder to pair with up to five Caregivers. *Central Monitoring will require a monthly subscription. Apple®, the Apple Logo, iPhone®, Apple Watch® and App Store are trademarks of Apple Inc., registered in the U.S. and other countries. HomePod™ is a trademark of Apple Inc.